In 1897-98 the VFL's representative team played against the Ballarat Football Association and the Bendigo Football Association but it wasn't until 1899 that intercolonial football resumed. The VFL had quickly established itself as Victoria's new leading football competition and by 1899 had also assumed the role of providing the colony's representative team. For this first match of the new era the South Australians continued to wear their old uniforms of the 1890s whilst the Victorians had no special representative jumpers made for the occasion, opting to play in Melbourne's uniforms. Searching for a new representative uniform, Victoria turned to the 1890-1892 colours of royal blue with a gold sash; the only design of that decade to last more than a season. These colours again proved popular and were worn for the next four years. It took the serious illness of Fred McGinis, a champion player for Melbourne in both competitions, to bring the bitter rivals together for this benefit match in 1902. The VFL deferred to the VFA on the matter of uniforms, allowing the association to wear their old 1890-1892 intercolonial design while the league donned Melbourne uniforms as a show of respect for McGinis. As far back as the 1893 Victorian team photo it is common to see two or three players wearing their sash the "wrong" way compared to their teammates, however photos reveal that for this match at the MCG the entire team wore their sash on the right shoulder instead of the left. Victoria adopted a new all-navy blue design that was simple yet menacing in appearance. From this point onward the various design features often changed but the Victorian team always took the field in a navy blue jumper. As noted by Michael Riley in his article Origin of the Big V, the new design for this game possibly led to dark blue becoming the standard colour for all Victorian sporting teams, with state rowing and athletics teams first adopting dark blue uniforms the following year. The gold sash made a brief return for this inaugural contest against the West Australians; this would be the last time a Victorian team wore a sash on their jumpers. The classic Victorian uniform starts to take shape with the switch from navy blue to white trousers. White quickly became the official trousers/shorts colour for Victorian interstate football teams, being worn in all but a handful of interstate games over the next eighty seasons. 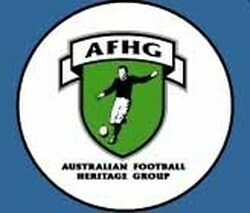 Interstate matches against South Australia ceased after 1904 due to a dispute between the VFL and the South Australian Football Association (SAFA) over the sharing of gate takings. The VFA sensed an opportunity to return from the football wilderness, quickly stepping-in to arrange a series of representative matches against the SAFA. The unavailability of New South Wales, Tasmania and Western Australia meant that the VFL had to settle for representative matches against the Ballarat FA and Bendigo District FA in 1906 and 1907; the first league seasons without an interstate match since 1897-98. Despite the lack of interstate football this period was an important one for the evolution of the Victorian uniform. Between 1897 and 1905 the VFL's representative teams had simply worn club uniforms for their matches against Ballarat and Bendigo. However, season 1906 saw the introduction of a special jumper for the league's representative team, with the letters "VFL" added to the front of the navy blue State jumpers worn the previous year. Following the VFA's representative matches against South Australia in 1905, the VFL reacted by arranging a meeting of Australasia's major football bodies which led to the formation in 1906 of the Australasian Football Council (AFC). Season 1908 marked the jubilee of Australian football and the newly-formed AFC organised a National Carnival to be held in Melbourne, featuring interstate matches between Victoria, South Australia, Western Australia, Tasmania, New South Wales, Queensland, and New Zealand. A number of teams adopted new uniform designs for the carnival and Victoria was no exception, wearing the first (not so) Big V in the State's footballing history. All VFL-AFL teams representing Victoria have worn a V on their jumpers since. After the 1908 carnival the South Australians returned to their annual contests against the VFA and, as had been the case in 1897-98 and 1906-07, the VFL played representative rather than interstate matches. Two such games were played in 1909 against Western Australian club sides Boulder City and East Fremantle. It remains unknown what uniform was worn by the VFL in these matches. No representative or interstate matches were held in 1910 - the only time this occurred in VFL history outside of the First and Second World War years when league football was played on a restricted basis. In 1911 Victoria adopted a new, much more prominent V on the jumper front and wore small numbers on the back of their jumpers for the first time. The V was the same size on the jumper as in 1911 but much wider at the top. The numbers on the Victorian jumpers also went from small to oversized, similar to those worn by all VFL clubs from the start of the 1912 season. The V was more like the 1911 design but a little wider at the top (about halfway between the 1911 and 1912 versions). Introduced for the 1913 season, this design continued to be worn for the 1914 National Carnival held in Sydney. With the arrival of World War I, Victorian representative matches ceased until 1919.